The Internet owed us some good news and it delivered with a kicker about a big cow name Knickers. Then the Internet found us something bigger, a cow name Cowboy in California. Knickers, who stands 6’4 inches tall, or 1.94 metres, is truly an oversized animal. He’s not record-breaking however. Bellno, an Italian steer, stands 2.02 metres tall. But Knickers, at 1,400 kg, is definitely the biggest steer in Australia. 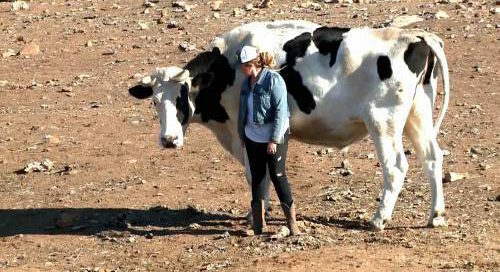 A photo of Knickers towering over all the other cows has gone viral. How Knickers got so big is not known. Pearson believes it’s just a matter of novelty. Knickers’ size has led to speculation he’s a genetic anomaly. News of Knickers fame has brought out another cow to the forefront. Cowboy, an abandoned bovine from Ramona, California is even bigger than Knickers. While Knickers stands just over 6 feet tall, Cowboy has five inches over him and stands 6’5. Cowboy is also a beefy 3,000 pounds. “He’s like a big giant puppy dog,” his caretaker, Lindsey Crouse, said. Cowboy who lives at Serenity Acres Horse Rescue with horse buddies and a pig name Pickles, is loves eating apples and carrots. He eats up to 100 pounds of food a day. But one thing is certain, according to Crouse. Cowboy won’t be shipped off for processing ever. He’s earned a spot forever at the 75-acre horse rescue farm after his rescue two years ago from his previous owner who died. He will also likely get bigger. Cowboy is still growing. When he gets to be a Cowman, he might break a world record. 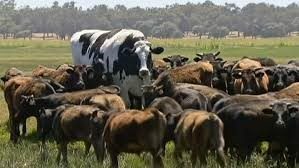 One Comment on "Bigger than Knickers, meet Cowboy the big big cow in California"